A long time ago, a girl named Carla lived on a goat farm with her father, Hector. One night, a goat disappeared from the farm and turned up flat as a pancake. Only one creature could do that--El Chupacabras, the goatsucker! Legend has it that El Chupacabras is a fearsome beast, but you can't believe everything you hear...and sometimes the truth is even more interesting. 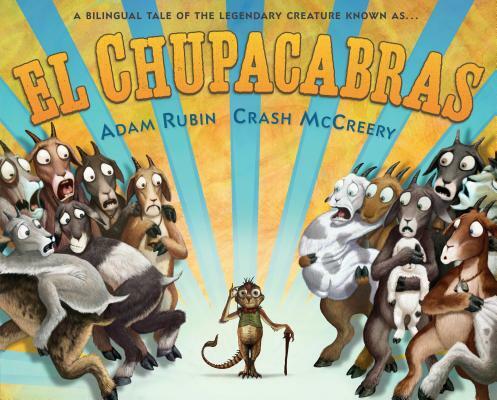 Told in equal parts English and Spanish by bestselling author Adam Rubin, and cinematically illustrated by acclaimed Hollywood creature creator Crash McCreery, this lighthearted take on a modern legend is not told in the traditional bilingual style. Each sentence is half-Spanish/half-English followed by a repetition of the same line translated the other way around. This mirroring technique allows the languages to intermingle equally. A fun and unique way to introduce either Spanish or English to new readers. "I decided to tell this story in an unusual way to explore the beauty of harmony. It's easy to dismiss the unfamiliar, but compassion takes a little more effort. With so many people trumpeting divisiveness right now, it's more important than ever to teach kids that there is more than one way to understand the world." Adam Rubin is the New York Times best-selling author of a half dozen critically acclaimed picture books including Robo-Sauce and Dragons Love Tacos. He spent ten years working as a creative director in the advertising industry before leaving his day job to write full-time. Adam has a keen interest in improv comedy, camping, and magic tricks. He lives in Spain. Crash McCreery is an Academy Award nominated creature designer, production designer, visual consultant, and illustrator who has created iconic characters for Jurassic Park and its sequels, Pirates of the Caribbean and its sequels, A.I., Rango, and many other blockbuster feature films. He lives in California.